Liverpool audiences have become very familiar with John Godber’s 1977 play Bouncers in a number of recent revivals, one of which was here at the Lantern. Less familiar is its 1985 bookend piece, Shakers, which he co-wrote with his wife Jane Thornton. While Bouncers features four tuxedoed men who play the eponymous doormen and all the other characters - male and female - Shakers is more or less the photographic negative of the concept. The 1980s breezed along on an overdressed carnival float of Dynasty glamour, and along with the big hair and shoulder pads came the cocktail bars. So here we are in Shakers – the new place to be on the high street for a night out, where everyone hides behind a veneer of self-conscious faux confidence and nobody knows what’s in the exotically coloured concoctions they’re drinking. The audience are in luck. Before the house lights even go down several of us are told we’re the hundredth customer and are handed a free drink - something luminous orange in a fancy glass – and so we meet the four cocktail waitresses in the usual garb, all bow ties and starched blouses, who are preparing themselves and the venue for the onslaught of an evening’s clientele. The idea is simple enough of course, as a series of episodes introduce us to groups of revellers, all of whom are played by the same three actors in unchanging costume. The first big win for the production is the seamless transition that they make as they take on the parts of groups of young women, a gang of lads and a party of businessmen trying to outdo each other with their worldliness. There is a good deal of dark humour in this role play, especially seeing four women aping the lewd, seedy behaviour of these male characters out to impress each other with their machismo. But as well as the carry-on humour there is a depth to the writing too, and in four excellent performances we see glimpses of the trials, tribulations, ambitions and failures that have brought these young women together to this place. There is hope for the future and jaded resignation behind the bar, where they listen to the same old jokes about suggestive cocktail names. They’ve heard it all a hundred times before, but still manage a weary smile that the half-cut customers take for amusement. 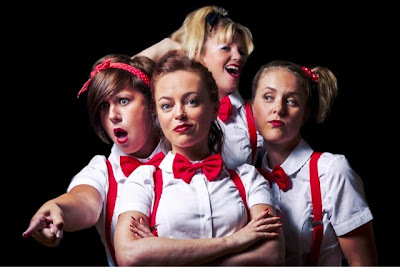 Amy Courtenay, Amy Spencer, Liz Walker and Jenny Roberts play together like clockwork in the fast paced dialogue under the direction of Pamela Courtenay for Trap Door Theatre Productions. This entertaining and often poignant show has played two nights at the Lantern and now heads off to several venues in Wales.